Who knew a book only 10 sentences long could inspire a film adaptation, let alone such controversy over that adaptation? Maybe it isn’t that surprising, considering that the book is Maurice Sendak’s Where The Wild Things Are, a now-beloved 1963 children’s story which was decried as too grotesque for kids when it first came out. It’s dark, twisted, cognitively fuzzy, and wonderfully unsettling; it’s no surprise grown-ups had a problem with it. In the ’90s, Sendak was scouting possible directors for a film version; once he saw Being John Malkovich, he decided director Spike Jonze was the man for the job. The project got underway in 2000, but reached a standstill when Jonze bickered with one studio, switched to another, then got involved with co-producing Jackass. Finally, in 2005, Jonze and co-writer Dave Eggers (A Heartbreaking Work Of Staggering Genius) completed a screenplay; Catherine Keener (The 40-Year-Old Virgin; Synecdoche, New York) and Max Records were cast, and shooting began. In 2008, rumors started spreading: The film terrified kids. Fans who saw leaked footage hated it. Warner Brothers was considering starting over from scratch. 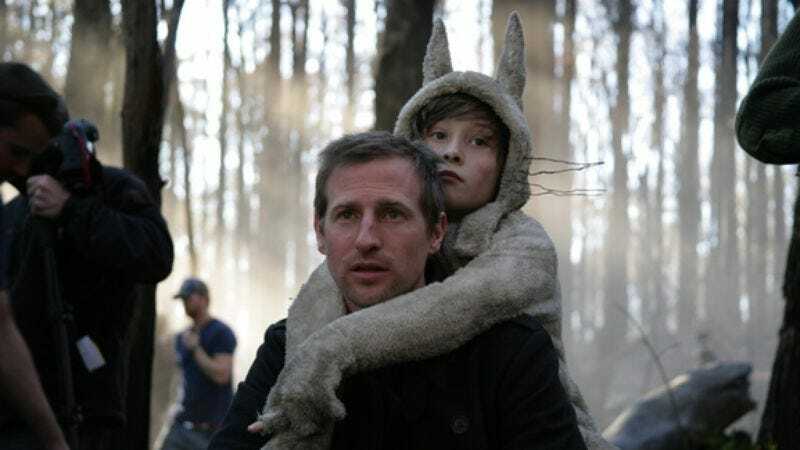 With the combined blessing of Sendak and the studio, Jonze has finally completed the film, making the changes necessary to keep the suits happy while staying true to his vision. And what a vision. Where The Wild Things Are, like its book counterpart, is sure to make some people uncomfortable, since unlike the spare book, the film has room to delve deep into the recesses of a child’s mind. And not only is it strikingly accurate to the book, but it’s haunting, beautiful, and really damn weird. A few weeks before the film’s première, The A.V. Club sat down with Jonze, Eggers, Keener, and Records to discuss the Nerf-fueled audition process, the film’s depiction of home life, and its truth to both adults and children. The A.V. Club: Why four of you in this interview? Dave Eggers: I’m happy to opt out, actually. Catherine Keener: No, come back. Spike Jonze: Because we made the movie as a group. I mean, if it was my druthers, we’d have everybody here that made the movie. We’d have 25 people. But yeah, I feel like the way we make movies is sort of as a collective, so it seems more interesting and appropriate to do this part of it as a collective too. AVC: Was it this collaborative from day one? SJ: I think we worked like that already, in videos and movies before, but on this one, the process was even that much more complicated and drawn-out. Max Records: Three million and 34. CK: How many people were on the crew in Australia? CK: Yeah. It was so huge, but it still felt like a skate video or music video, didn’t it? Still felt really intimate and fun, and yeah. DE: It was a happy set. I was only there for, what, three days or something. But that’s when you arrive on the set in Melbourne, and you see 150 people and this whole sort of mini-factory creating animatronic owls, you know? And people building mountains and everything. I saw them building them, and that’s when you actually feel ridiculous for having written some of this stuff. Because you just think, “Yeah, there’s a couple talking owls, and blah blah blah.” And then these highly specialized craftsmen have to spend months of their lives to do it. CK: But then the owls got a lot of play in this movie. DE: Well, yeah, they ended up being big players. MR: Yeah, they actually used their voices in the movie, didn’t they? CK: Well, maybe they were in the rehearsals with us. The guys came and rehearsed as the birds. SJ: That was my… Don’t steal my credit. CK: Oh, you’re the owls? MR: That was you? Oh, I thought it was the puppeteers that were hiding. CK: No, but those guys were amazing. AVC: This is the one thing Spike did the entire movie. AVC: What was the first scene you guys shot? AVC: So the first scene of the movie? SJ: We started at the beginning, yeah. AVC: Was that intentional, to start at the beginning, or is that just how things shook out? SJ: It was intentional to put all the stuff at home up first, so we’d start establishing that. And we’d establish who Max was at home, and then go to the island. So we did it that way. It worked out well. AVC: What’s the brief version of how you all came to be a part of this film? SJ: I came about it because I was lucky enough to know Maurice Sendak, and talked to him about doing the movie. For a while, I was really apprehensive of it, because it’s a book I love so much, and I didn’t want to add something to it just to be able to make a movie, or put my stamp on it, or something like that. But at a certain point, it hit me what the movie could be, and I started talking to Maurice about it, and I started making notes. I talked to Maurice about how I wanted to write it with somebody, and I suggested Dave Eggers, and Maurice loves Dave’s work and loves his books. DE: He had no idea who I was at that point, but thank you, though. That’s nice. SJ: That’s not true. He had read your first book. MR: The funny thing is, I actually knew who you were. I don’t know why. DE: Liars! Everyone’s lying, lying, lying. AVC: What did you think of him before you met him? MR: I think I thought you were, like, a pro football player or something. But I knew your name, and that’s the important part. DE: Wow. I really appreciate that. That was my wish. MR: I either thought you were a pro football player or a writer. Because we have a friend who’s a writer who knows you and stuff. AVC: Catherine, you’d worked with Jonze in the past. Was it easy to get involved this time? CK: Yeah, I’ve worked for him three times now, as basically his sort of… First, the actor in that movie, and then the joke in the second movie. And then this one is sort of like his… Well, Natalie’s the top-dog assistant, and then I was sort of the next person. SJ: You weren’t my assistant. CK: No, but you know what I mean. SJ: She was my sort-of partner. She was like our utility player, when we needed a creative brain, she could work with Max, or she could work with the wild things. SJ: It was like an assistant director, but in a different way. MR: You were secondary top dog. CK: There was no department for it. I just mingled. AVC: So you were around for most of the process? CK: Mm-hm. When we did the first voice shoot, Spike and I would play Max; we would alternate playing Max for all the other actors, and there were nine shooters with cameras who would just take one character each. So it was an amazing kind of dance they all did, [to Eggers] and you were there for that. You were outside in the holding, on that couch. That red couch. DE: Well, I was in the room, it was a big soundstage, and everyone was in vague costumes sometimes, but with headbands on their heads, and a microphone hanging down or something. It was so ludicrous. CK: Yeah, those terrycloth tennis ones, you know? DE: It was like everyone playing jai alai or something. DE: They looked like some ridiculous costumes, but that was my first experience on any set. And I just couldn’t get used to the repetition, because I would hear the perfect take the third time, and then Spike would do 30 or 40 more. I went around the bend, I had to leave the room repeatedly and just rest so that I didn’t have to keep hearing the lines. But that shows how much I know about film. I don’t think I would last very long. CK: But didn’t you have headphones on out there? DE: No, I would take those off, too, and do something else for a while. DE: Did you ever have a parent say something like that to you in the heat of something? Or—your parents are more together. AVC: Well, my parents are perfect. DE: [Laughs.] Yeah. He says, into the microphone. SJ: Was it jarring because it struck a nerve with you as a kid? AVC: It feels like a very knee-jerk reaction to something relatively mundane that Max does, and it’s almost like a question posed to the audience that deals with what we’re about to see. SJ: When the book came out, the book got a lot of negative attention from child psychologists and librarians and Better Housekeeping-type magazines. MR: People who pretend to know things. AVC: The main detractor never read the book. SJ: The main guy, this famous child psychologist. SJ: Yeah. He hadn’t read the book, but I think a lot of people, they had read the book. And one of the things they criticized it for was showing a child that out of control, and that the parent wasn’t there to teach them a lesson and hold their hand through it, and at the end of the book, there wasn’t a simple lesson learned. Instead, the mom acted out, yelled at him, sent him to his room, didn’t help him with anything, and called him a wild thing. And, like Maurice says, “Well, that’s true.” That would have been nice if the mom could have done that, could have stayed calm and reacted that way, but a mom is a person too, and we all lose our way. He speaks about it much more eloquently than I’m paraphrasing him, but I think that’s the same thing. It’s like, we’re making a movie where we were trying to capture what it feels like at times to be 9 years old. DE: We’re in an era where they’ve sanitized home life in movies to such a degree that there is a certain home life that might be true if you have two perfect parents, and a nanny, and a couple babysitters, and support, and lots of money, and there’s no strain at home, or whatever. But for most people, there’s strain, you know? There’s a lot of pressure, things can’t be perfect, parents can’t be perfect all the time. There’s a divorce, there’s money issues, whatever. People work, so you don’t always have these vast reserves of patience every time your kid goes crazy. So I hope that line is jarring, because it seems true. [pagebreak]AVC: Also, for the rest of the film, we’re enveloped into this child’s mind. But given the fact that the line comes out at the beginning, it somewhat affects the rest of what we’re seeing. “What’s wrong with you?” followed by a lot of twisted thoughts that seem wrong. SJ: You’re the first person that’s mentioned that. I’m not here to justify it. That’s exciting that you had that reaction, and I’m not sure if I could even explain it in any satisfying way to you, but that’s exciting to hear that. CK: Yeah, I like it too. I know, seriously. You perked us all up. So you actually are looking at him, trying to crack what’s wrong with him. DE: My parents told me they were going to kill me at least a thousand times growing up. “I’m gonna kill you,” and then they’d whack me on the side of the head or whatever. DE: And “What’s wrong with you?” And “I’m gonna lock you up,” and “I’m gonna throw you out the window,” and “I’m gonna kill you.” You know, all these things that you say in the heat of a normal chaotic household. But there is a certain weight where Max is wondering what’s wrong with him. Am I normal? Are these behaviors normal? Is my wildness normal? That was the central question that Spike wanted to really get at, from the beginning. Before we even started, that was a basic tenet that he wanted to explore. As a kid, you don’t know; you’re just trying to navigate how much is acceptable, and where does everything belong. CK: And what did you do? What are you responsible for? The fact is that things are way beyond Max, and as a kid, you often feel that everything is your fault, everything is your doing, you know? AVC: What’s the significance behind the names of the wild things? SJ: I don’t know if there’s a significance. I don’t know. Dave? DE: Well, you named most of them, I would say. Didn’t you? SJ: Yeah, I mean, I think they just have names that felt right to me, nothing more analytical than that. CK: Yeah, I wondered too, and there was absolutely no—seemed like there was no real reason for it. DE: Well, there were certain ones, like I don’t know where you came up with Carol and KW, but Douglas seemed like for the first mate, or the guy that Carol relies on all the time. A very solid, straightforward, reliable guy would be named Douglas. DE: And then Ira seems like the guy that feels kind of needy and insecure. CK: But by the end of it, everybody was exactly right. AVC: Spike, you’ve said in other interviews that the wild things themselves are based on personifying “big” emotions. SJ: Yeah, or unpredictable emotions, or wild emotions. AVC: Given that, were there any trying days on set, playing the emotion to the hilt? SJ: It was a pretty crazy shoot. As fun as it was, and as positive as it was, it was also pretty intense, because just the way we shot it wasn’t easy. We shot it on location with these giant creatures, and all these special effects in-camera. We didn’t rely a lot on post-production visual effects. “Oh, we need a tree to fall.” We’d knock a tree down and stage that. A lot of just complicated stuff. In the middle of that was Max. Max was the most important part of the movie. He’s the heart of the movie. He’s what carries the movie. So in the middle of this crazy physical production, we needed to make sure we gave Max the space to do the scenes that were emotionally challenging. DE: What was the hardest day for you, Max? MR: It would be the three times that we had to reshoot the inside-the-stomach sequence. Over and over and over. They had me go down a little chute into KW’s mouth, and then there was a shot where it’s like a hammock, made out of some weird material. What was that stuff? MR: We had to reshoot inside the stomach. SJ: Oh, that one too. But the one that was really uncomfortable was where we had to wedge you down into that, and jam you. He had a harness on, this skintight harness under the wolf suit with cables, and so already that was suffocating him, and then we covered him in this gel. And so he’s hot, he’s suffocating, and then we had to jam him into this chute. And I think the first time, we didn’t even get the shot, because we realized that it was way too tight, and he couldn’t really—it was not comfortable, so we yanked him out and had to rip the set apart and rebuild it. But that was definitely hard, because we were asking a lot of a 9-year-old kid. We were asking a lot of any actor. DE: But luckily the child-labor laws in Australia are very lax. So that’s why it was done there in the first place. It was either there or Cambodia. MR: Didn’t you guys have to obey the California labor laws? SJ: We did, actually, yeah, because the movie was set in California. Or not set, it was based. Something like that. SJ: All these PAs pushing on the side of the fabric, and mushing him. Meanwhile, Max is just trying to do the dialogue. AVC: Speaking of Max, the Wikipedia page says something to the effect of “Thousands of troubled youth showed up for the audition.” What was the Max audition process like? SJ: Well, our casting people probably auditioned a thousand kids, and I probably auditioned 50 kids myself. And we’d find these amazing kids, a lot of just really captivating kids, just sitting there talking to them about life or doing a scene, but Max has such a wide… The character we’d written, the performance we had written, was a very wide range of emotions and aspects. Finding a kid that could be introspective and internal and thoughtful, and then also be wild and free and guileless and physical, it was hard. We’d find a kid that was amazing at one thing, or amazing at the other, but not many that were amazing at both, so at the end we started getting down to panic time, and we still hadn’t found our Max. And we decided to go about it a different way. Instead of the traditional casting people in all the big cities in America, we said, “Let’s just find friends of ours that live in interesting cities in the country that maybe aren’t as big, and people that don’t do casting.” And thinking maybe you find a place that has an artistic community, maybe we’ll find some interesting kids from there. We had a friend of ours, Lance Bangs, who’s a documentarian based in Portland, and a graphics designer in Athens, Georgia, and another friend up in Northampton, Massachusetts, go and do a three-week blitz of just pulling kids that they knew from around, or kids that they’d see around. And that’s how Lance Bangs found Max. He saw him on the set of a Death Cab For Cutie video, so Lance auditioned Max, and then Keener was up there shooting Into The Wild, and so we asked Keener, on her day off, if she could audition him. CK: I had been doing that anyway with Spike. I’d go in and just read or make stuff up with the kids who were coming in to audition. SJ: She was already involved. CK: It was just wild. Fun. SJ: What was it like for you, Max, when they called you and somebody said they were making a movie of this book? AVC: Were you familiar with the book? MR: Yes. Certainly. I guess it was kind of weird, and when my dad got that e-mail from Lance, asking whether I’d like to audition, I guess we just sort of thought, “Sure, it’ll be fun. We’re not going to get the part, but you know. It’ll be fun and stuff.” And then Lance came to our house and had me go and attack my parents in the backyard on a hammock with a plastic sword or something. CK: They didn’t know you were going to do it? Your parents didn’t know you were going to do that? DE: That was just a personal vendetta Lance had. Later on, you did the audition. MR: But yeah, I think he had me blow up a couple of water balloons and do target practice or something along the back fence. [To Jonze.] The final audition that I had with you in L.A., you shot a Nerf gun at me and had me try to block the bullets with an umbrella. MR: And then we took those Socker Bopper things and had me just pound on you. CK: I had one arm, didn’t I? SJ: Well, I don’t think we ever… In the shot, we do a lot of things like that to give him something to react to. So it wasn’t like we’d ever expect Max to think Keener was really hurt, but it was just to give him something to react to instead of those kinds of movies that are all on a green screen, and they’re like, “Okay, spaceship blows up over here, and you’re really scared, and run!” The kind of performances you’re going to get that way are going to be probably not as visceral, so we went out of our way to always give—when we couldn’t stage what was happening behind camera, we would stage something that could give Max something to react to. MR: Some of the wild things had lightsaber fights off-camera, and then you learned how to do that fire-swallowing thing, and that always freaked me out, because you always burned up your tongue really badly whenever you did that. SJ: I learned it from Keener, but I didn’t learn it correctly, I guess. AVC: More than any film this year, everyone seems to have an opinion about it, before it’s even come out. How much of those people’s anxieties leaks into the creative process? DE: A lot of that had to do with Maurice’s blessing, though, too. Maurice pretty much asked Spike to do it. And if it was a different thing where he had somehow released the rights or didn’t control them himself, and wasn’t involved, I don’t think any of us would have done it. SJ: The fact that Maurice said, “This is something that I made at your age, this was something that was personal to me, and now you need to take it and make something that’s personal to you.” I don’t know, but we made the movie that we set out to make, and Maurice loves it. If Maurice was anxious about it, then I would be petrified. AVC: Max, do you think it’s true to kids? MR: Yes. If there is one thing that just pretty much cannot be said about the book and the movie, it’s that it at all talks down to kids. And I think it’s very, very true. AVC: Is that what you think makes it the most true? That it doesn’t talk down? MR: What makes it the most true is that they have temper tantrums. They go out and beat on things with sticks. They have weird furry creatures that are really, really freaky. They want to go out and make an igloo. They want to go make a giant fort, you know?